Tales From The Game Grid #2 | The Arcade Archives! When you think video game couples who do you think of? Mario and Princess Peach, Sonic and Amy, Zelda and Link, or Kirby and Food. I decided to do this month comic I did it on one of the oldest and most famous of relationships: Pac-Man and Ms. Pac-Man. It’s hard for me to think of a world without these two in it because they have been around since before I was born. I don’t exactly remember the first time I ever played the game but I do know that it is one of my favorites. Pac-Man was one of video games first celebrities since his creation in 1980. His game was simple but addictive. Even by today’s standards the game is pretty solid. Ms. Pac-Man created in 1981 is one of the first female video game protagonist. Equally as important is the fact that it is the first video game to use cut scenes weaving a story as you play of how they both meet. As for the comic I had this idea one morning as I was waiting to clock in for work and just with all my ideas I started to sketch. The idea was easy and simple as the Pac-Man games themselves. Trying to come up with a design of the characters was also an easy task. I wanted something different than what some people have done before yet simple. Since there has been several cartoons series and shorts made I wanted to make something that looked like them but at the same time looked original. I think their very basic design work well and was definitely one of the easiest to clean their lines. I hope you enjoy this month’s comic and please spread the word to other and leave me some comments to let me know how I am doing. 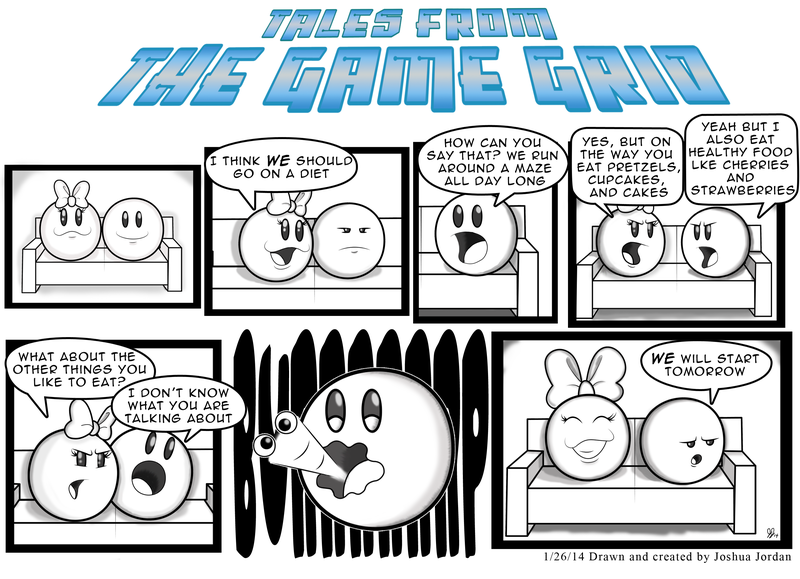 This entry was posted in Archive Entries, Tales From the Game Grid, Webcomics and tagged #Mrs.Pac-Man, #talesfromthegamegrid, pac man by ubernerd527. Bookmark the permalink.